Macquarie Bank has finalised negotiations with the NSW Government for air rights above a new Metro station at Martin Place, clearing the way for the bank’s ambitious commercial proposal over the station to proceed. The proposal was previously approved as part of the Department of Premier & Cabinet’s unsolicited proposals process but required the negotiation of these air rights. The agreement marks a new era in the delivery of mass transit infrastructure in Sydney, demonstrating a form of value capture. It also puts on show the focus of Sydney Metro Corporation in strategically matching new metro stations with the leveraging of land use potential. This is part of a broader trend in Sydney and other global cities; London’s Crossrail project - a suburban-rail, rapid-transit line which alleviates constraints on the Tube Metro network - employs a similar commercial arrangement to construct some of its new city centre stations, most prominently at the financial district at Canary Wharf. Macquarie Bank has agreed to pay $355 million for the Martin Place station air rights and will proceed to build the metro station and two commercial towers, in partnership with Lend Lease. The distinctive northern tower design responds to the challenges of protecting sunlight access to Martin Place - in fact, both towers are fully compliant with City of Sydney solar access planes which protect sunlight access to Martin Place and Hyde Park. The north tower is approximately 170 metres tall (38 floors) with almost 80,000 sqm of premium office space. The smaller south tower, amended to provide commercially viable floor plates of 1,100 sqm, offers 39,000 sqm of premium grade office space over 28 floors. As a result of the deal, the Government will foot little of the $378 million cost to build the new station and its associated connecting passages. 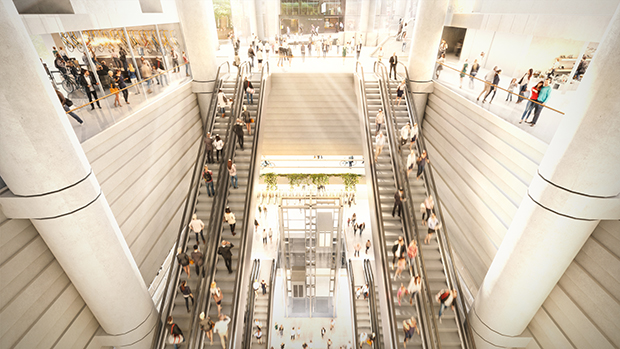 The new station is being compared in style to New York’s WTC and Hong Kong’s IFC stations; the station will become part of a new retail and social precinct that is envisioned to be an embedded, seamless part of its locality. ​​​​​The scale of the precinct is impressive, and it should be noted the level of attention afforded to the quality, legibility and experience of the pedestrian environments, both in the underground concourses and at street level. Grimshaw in partnership with Johnson Pilton Walker and Tzannes, are the architects responsible for the design of the station and its commercial and social precincts. The firms have a long experience in crafting quality human-scale environments. The station connects to the T4 Bondi Junction & Illawarra suburban station; it is likely to also connect to a new CBD station as part of the mooted West Metro line. Collectively, this anticipates a northern CBD mass transit interchange, relieving overcrowding at Central, Town Hall, and Wynyard stations. 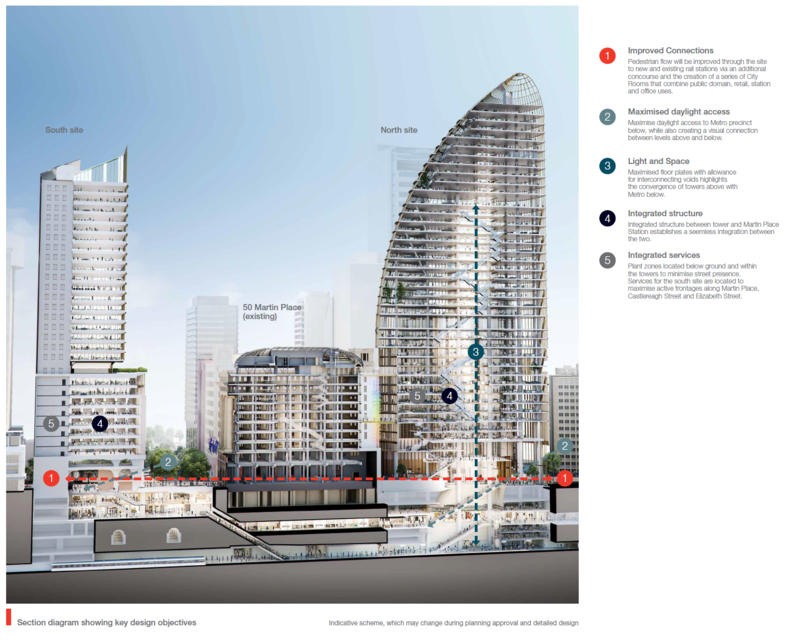 The development reinforces the role of the northern CBD as the financial hub of Australia and as a globally connected business precinct. The towers feature modern side-cores with large, uninterrupted floorplates ensuring flexible office design that can adapt to future needs. The proposed buildings have been awarded 6-star environmental ratings from the Green Building Council of Australia and will house workspace for 8500 people. 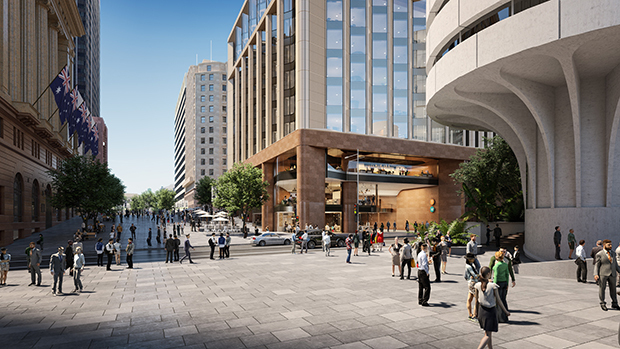 Macquarie Bank will consolidate its operations in the northern tower, which will be connected directly with its existing heritage headquarters at 50 Martin Place. In the broader strategic context, this is just one - albeit prominent - example of similar projects in the pipeline; new metro stations at Victoria Cross (North Sydney), Pitt St (Town Hall), Waterloo, and Crows Nest are undergoing similar work to both embed them in their locality and leverage the transit capacity and connectivity they bring. 2500 new jobs will be created during construction and the office towers, social and retail precinct, and the station are expected to be completed shortly before Metro City & South-West opens in 2024.